N Poornima Sai from Hyderabad, B.E. - B.Tech Graduate. N Poornima Sai is Engineer and currently have no work experience. CREATIVE THINKER MULTITASKING WORKOHOLIC POSITIVE ATTITUDE.. INNITIATIVE GOOD ANALTICAL SKILL.. TEAMWORK & PROFICIEN..
are one of expert skill area's of N Poornima Sai . 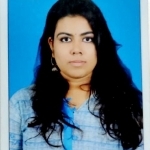 N Poornima Sai is working in Engineering Project Mgmt./Site Engg./Civil Engg./Construction industry.